We are pleased to offer our Family Education Series to DSC members. The Family Education Series is designed to educate and empower families of individuals with Ds of all ages. New events will be added here as they become available, as well as on our private FB page. Stay tuned for more information and upcoming events! Join DSC as we welcome Rochelle Drill, Ph.D of Kennedy Krieger Institute. Dr. Drill's presentation, "My Child Won't Listen: Behavioral Intervention for Tantrum and Noncompliance Among Children with Down Syndrome" will focus on behavioral strategies for treating and preventing home-based tantrums and noncompliant behaviors for school-age children. Dr. Drill is originally from Bethesda, MD. She completed her graduate school education and received her Ph.D. in School Psychology at Indiana University-Bloomington in May 2017. She completed her doctoral internship at the Kennedy Krieger Institute/Johns Hopkins School of Medicine from 2016-2017 and completed rotations in the Pediatric Developmental Disabilities Clinic and the Neurobehavioral Unit-Outpatient Clinic (NBU). She is currently completing her year-long postdoctoral fellowship in the Pediatric Developmental Disability Clinic, and will be joining a private practice in January 2019, which specializes in the neuropsychological assessment and behavioral treatment for children with Autism Spectrum Disorder. 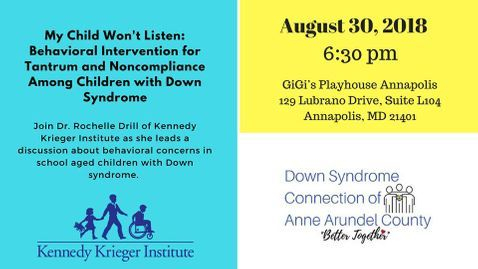 Thank you to our friends at GiGi's Playhouse Annapolis for the use of their space for this presentation. We hope to see you there! Please RSVP on our FB page here. Thank you and we can't wait to see you on August 30th!